Chromebook x360 14 is HP's thinnest Chromebook convertible. 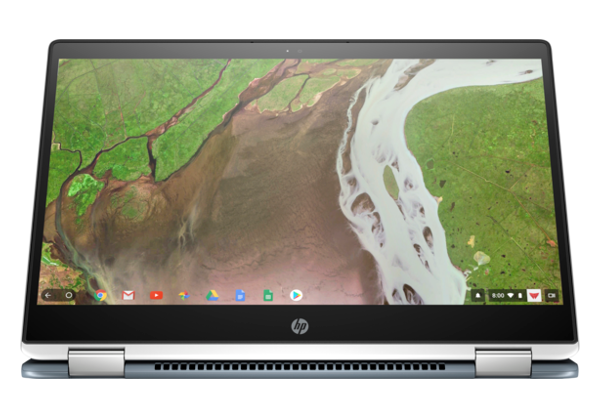 HP today announced the Chromebook x360 14, HP's thinnest Chromebook convertible device. The Chromebook x360 14 offers 14-inch touch display, 8th gen Intel Core processor and up to 8GB of RAM. The Chromebook x360 14 device features a 14-inch diagonal FHD touch display with an ultra-thin narrow bezel (7.5 mm). For demanding tasks, the Chromebook x360 features up to 8th Gen Intel Core i3 and i5 processors for enhanced performance. The device comes with up to 64 GB of SSD storage for fast processing and boot time, and up to 8 GB of DDR4 RAM to multitask with ease. Users also expect long battery life beyond the traditional eight-hour day. The Chromebook x360 has up to 14 hours of battery life. And the Chromebook x360 also comes with a broad array of ports for connectivity, including 2 USB Type C, 1 USB Type A 3.1, a Micro SD port, and Audio jacks (in/out). With its four unique positions, the Chromebook x360 offers versatility and users get all the great benefits of Chrome OS: an easy-to-use, stable, speedy and secure computing experience. The Chromebook x360 offers a gorgeous, premium design and elegance with 3D stamped metal keyboard deck and a diamond-cut trim on the touchpad. An Advanced Electrodeposition (AED) application gives the device's cover a protective and decorative coating, creating a ceramic-like white finish. In addition to the beautiful matte design, this maintains the metal characteristic of the Chromebook x360 and provides additional strength, durability and scratch resistance. Additionally, the anodized aluminum keyboard deck in cloud blue with color matched keycaps offers subtle premium touches designed to turn heads. The HP Chromebook x360 14 is also available for pre-order beginning today at BestBuy.com and is expected to be available in stores on October 21.